For those of us who are preparing to send a kid off to college this fall, the search for those Twin XL sheets is on! I received a mail from the university early in the summer, touting a company (Residence Hall Linens) that would provide bedding guaranteed to fit the dorm beds. I promptly visited the website and although the vast majority of products were imported, I was pleased to see several bedding packs that were said to be made in USA. However, after receiving my “All American” collection, I was dismayed at the quality of the towels (very thin) and the comforter was clearly labeled “Made in Pakistan” and had a cheap feel. I took the plunge and ordered the American Dorm Bundle from American Made Dorm, and did a direct comparison of the two company’s offerings for myself (see below for the details). The American Made Dorm set was about $100 more than the set from RHL, but came with 2 sets of plush 1888 Mills towels, higher thread count sheets, and a much nicer comforter with matching pillow sham, decorative pillow and laundry bag. Bottom Line: If you can afford the extra money (remember this should last for years), then I definitely recommend the American Made Dorm products as much nicer quality and truly made in USA. 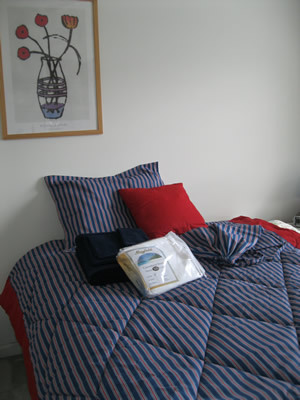 Pillow Sham and Laundry bag made from fabric to match comforter, 100 percent cotton duck, by Victor Mill. I would not try to save on a bed. It's very important to get a good rest and a good matress is key, especially for kids who go to college.